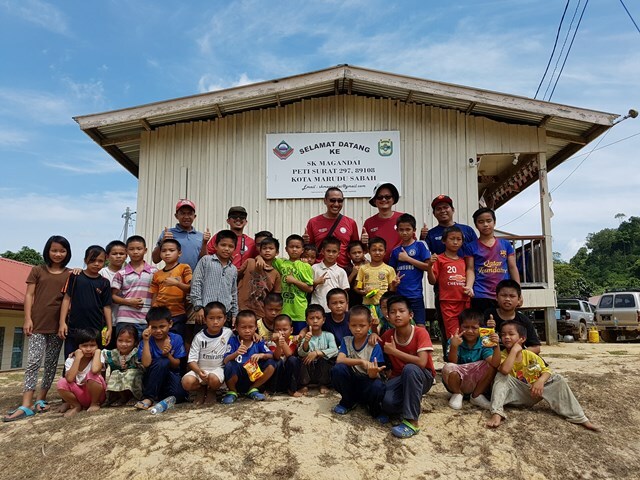 TUESDAY, 23 AUGUST – The Four Wheel Drive Volunteer Club Universiti Malaysia Sabah (UMS 4WDVC) successfully held their corporate social responsibility (CSR) through their Community Exploration Programme at Kg. Magandai, Kota Marudu, recently. The three-day programme aimed at helping the rural community in developing sustainable ecological practices, led by Deputy Vice-Chancellor of Research and Innovation UMS and the current President of UMS 4WDVC, Professor Dr. Shahril Yusof. According to Prof. Shahril, UMS 4WDVC was often involved in CSR mission involving the use of 4-wheel drive vehicles and had chosen Kg. Magandai as the route to get to the village was very difficult and challenging. “Volunteers comprising 27 staff of UMS planted durian trees around the school area as part of their CSR efforts. “School children were also taught on the importance of planting fruit trees and responsible for maintaining the trees planted,” he said. Prof. Shahril said, besides planting fruit trees, the volunteers also had the chance to jungle trek to Kg. Minisulang located some eight kilometres from Kg. Magandai to appreciate and feel for themselves the experience of the villagers who had to use the jungle trail as their routine track. A motivational programme with the students of SK Magandai was held in the evening, which was presented by Dr. Abd. Hakim Mohad, a senior lecturer at the Centre for the Promotion of Knowledge and Language UMS, who stressed on the importance of achieving success and continued efforts to attain a higher level of education up to university level.